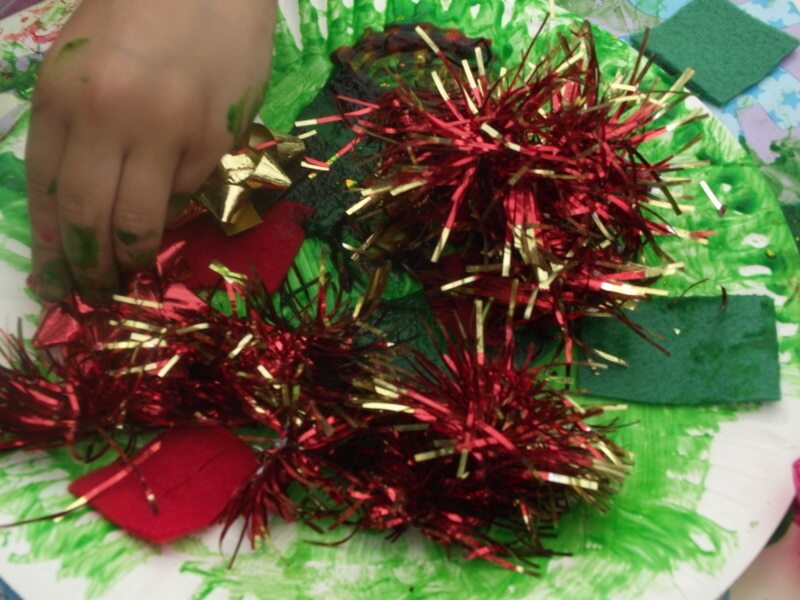 Christmas crafting with toddlers shouldn’t be a stressful process – keep your activities simple like this easy to set up Christmas wreath and you can enjoy adding a little festive twist to the usual paste and paint fun without a whole lot of fuss or adult led interference in their important work! 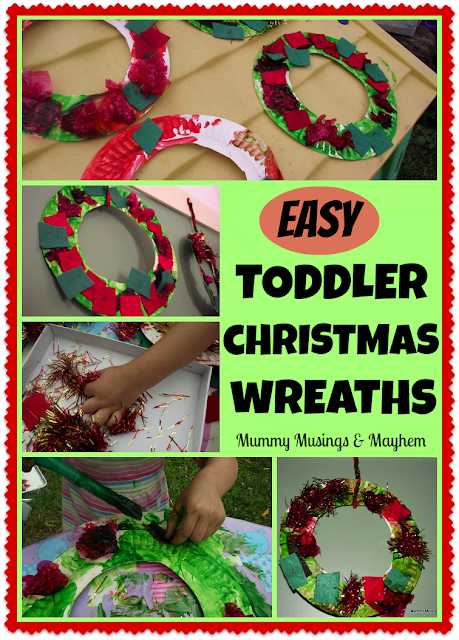 There is very little preparation for this activity but once ready you can just sit back and let them decorate their wreaths any way they want to! Mixed collage scraps – I used some cut up tinsel scraps, felt scraps, cellophane and sparkly bows from our Christmas collage box. Use whatever you have to hand, no need for it to be Christmas themed! Turn the paper plates upside down and then cut a rough hole from the middle…you can be as precise as you want to be here but to be honest I don’t think you need to worry about perfection…you are just providing the canvas for their creating! Stand back and let the creativity begin! 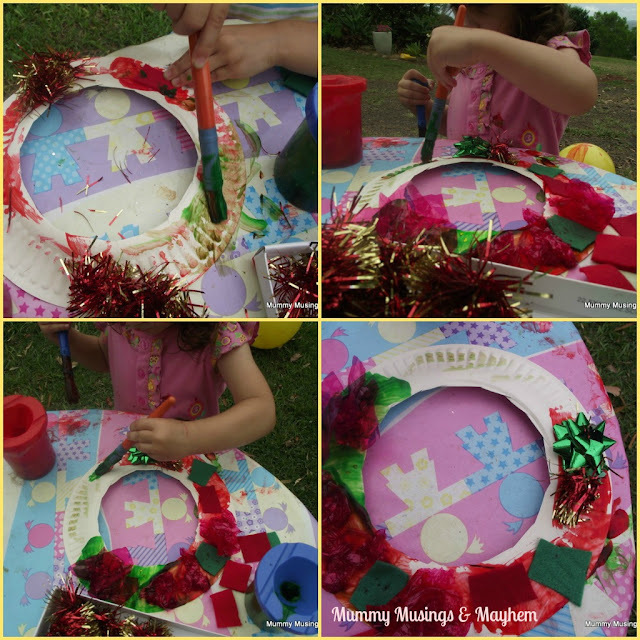 Our Christmas collage box gets a lot of use at this time of year…saves so much time if you put one of these together before you start some toddler Christmas craft, I just add bits and pieces to it throughout the year. I used a couple of old shoeboxes and just filled them with cut tinsel, red and green felt squares, green and red cellophane, some gift bows and anything else that caught my eye over the past month. 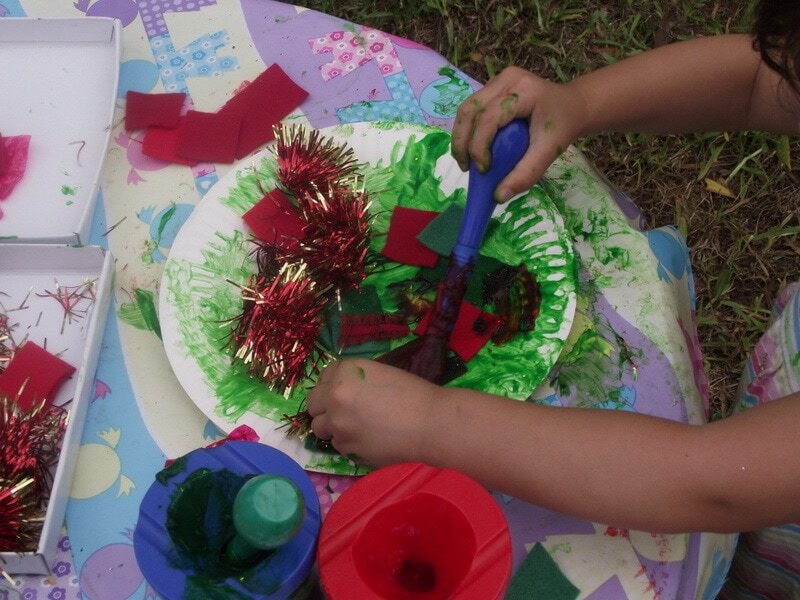 Then when we pull out a Christmas activity I just choose a few things and set out on trays or the box lids and let them explore and use what they want to! Both girls absolutely loved the patterns the brush made as they painted over the ripples on the plate…an unexpected bonus to the activity!! As soon as I sat the paint and the plates down the girls got straight to business! Both decorated in their own unique way…Tara was very precise with where she painted and then placed her collage pieces…arranging them just so! Ruby did a lot of experimenting first it seemed…painting a bit, then sticking a bit, then going for a wander and coming back to add more…she really loved the sensory experience of the bumps on the plate and spent a lot of time painting this area. 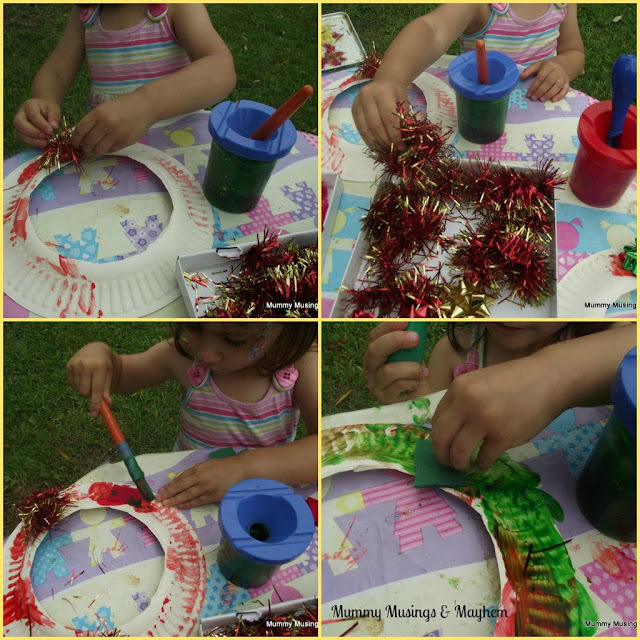 I like to do these sort of activities outside with toddlers because often they feel the need to create a little then wander away to play then return to finish their work. 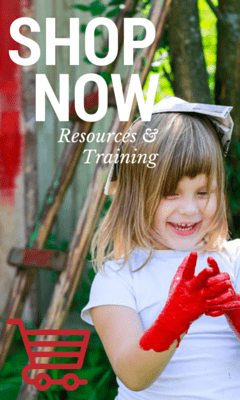 Often when we do painting inside we can be a little to quick to clean everything away because we don’t want messy hands and toddlers wandering around touching furniture and walls. By setting up outside you can allow the simplest of activities to evolve the way a toddler likes it and there are no walls to worry about! Of course there was also a little taste testing….but that’s why I like to use the cornflour paint…nothing to worry about then although I did direct her back to painting the plate instead! 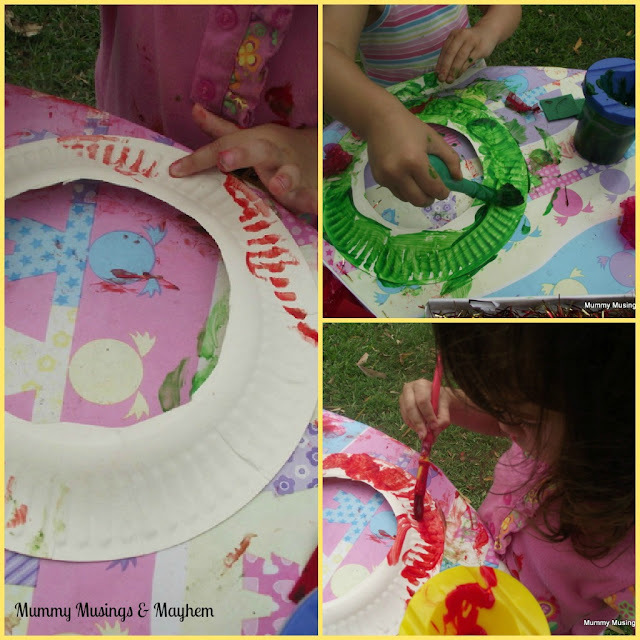 We went through quite a few plates so I recommend having a few ready to go as it is such an easy and fun activity for toddlers that they really enjoy completing quite a few…exploring something different with the creativity of each one! As you might see in the pic below Ruby also decided that the ball needed a little Christmas cheer too! 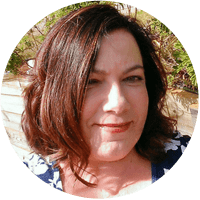 Tara spent quite a lot of time on each creation…often taking pieces off and rearranging them…. It can be hard at times not to be tempted to ‘fill in’ the gaps on the wreath for them but just think how we might feel if someone came along and ‘fixed’ our masterpiece after we had spent so much time creating it! 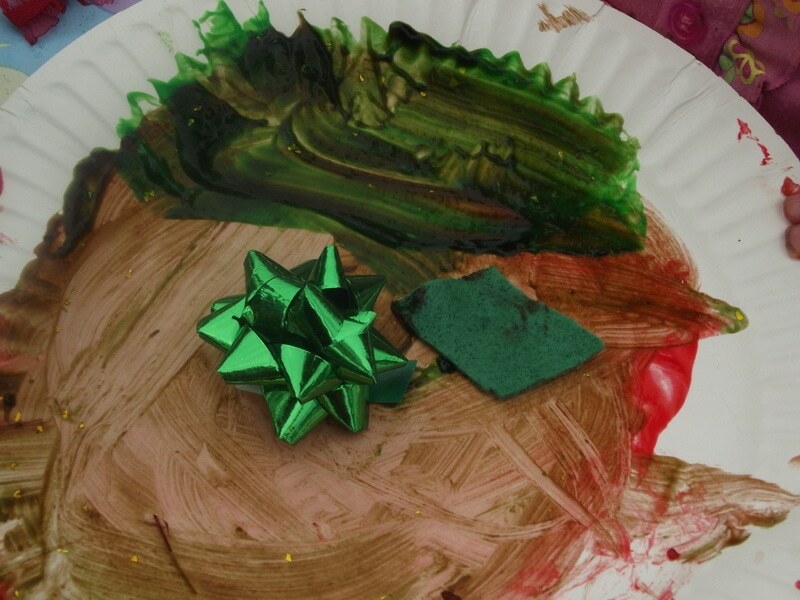 I did add a little kid’s PVA glue to the paint pots just to help the collage pieces stick as I knew they would load the wreath up once they got started! I included a few larger pieces of cellophane in the trays and showed the toddler twosome how to scrunch them with their hands and then stick them on. There really are a lot of opportunities for fine motor practice with this activity, lots of picking up slippery little pieces and arranging on the wreath….a bit of problem solving too as some areas filled up and others stayed empty….Tara wasn’t happy with that and worked out how to fill in her gaps. Ruby isn’t quite at this stage yet but her wreaths were no less beautiful! Hang where they can be admired for their cheery Christmas splendour….and enjoy pulling them out again next year! I like to write the girls’ names and the year on the back so we can look back and remember the fun when they next come out to deck the walls! 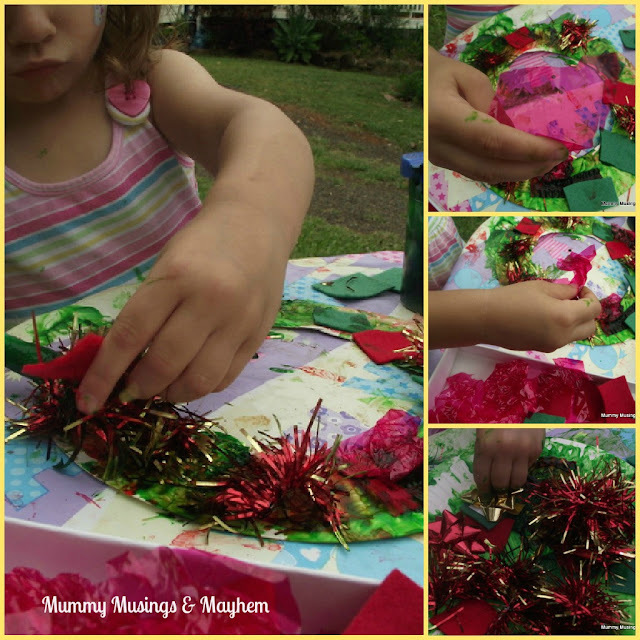 A really simple Christmas craft but one that toddlers can fully participate in and therefore achieve a sense of pride and satisfaction…..when you run out of wreaths just keep passing them paper plates to paint and collage….the girls had fun with this activity for well over an hour with very little input from me. 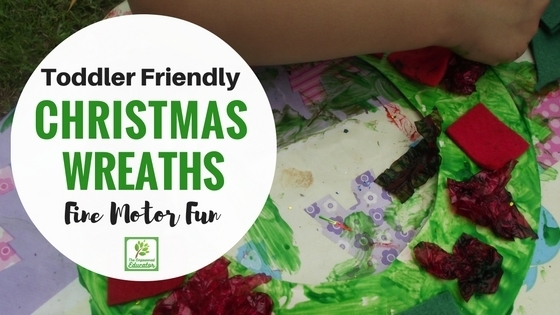 I have noticed that one of my favourite blogs at Home with Ali also just recently did some lovely colourful Christmas Wreaths too…she added some sweet little bells which is such a great idea…why not pop over for a look…there are lots of other Christmas crafts and toddler inspiration there too! If you use Pinterest why not pin the image below so you can easily revisit this idea when you need to! I love your wreaths, I love the addition of tinsel – my girls would be so jealous. Have a wonderful early Christmas. 🙂 Thanks for mentioning our wreaths too. If I get time this week I am absolutely stealing this idea! I know my kiddies will love this. But I’m kicking myself I sent a bag of tinsel to the opshop! Thanks Jode, as always you are so creative with kids crafts, such an inspiration!